To continue with our report of the Cat Fancy in its infancy – Our present CFA was not in existence, and the only National Association was the ACA. It was stated in the 1958 yearbook that the American Cat Association was founded in 1906, but further research shows that it was incorporated May 11, 1904, in the State of Illinois. Member Clubs were: Atlantic Cat Club (New York), Beresford Cat Club (Chicago), Connecticut Cat Club (Stamford), Lockehaven Cat Club (Rochester), Michigan Cat Club (Detroit), and the Washington Cat Club. Mrs. Clinton Locke, of Chicago, was the first President and Mrs. William Hofstra, of New York, the Vice-President. Because of these differences of opinion, there was a rift and the Cat Fanciers Association was formed in February. The first advertisement for the new Association appeared in the March issue of the “Cat Journal”. The following officers were listed: President, Mrs. W. A. Hofstra; Vice-President, Mrs. A. Jackson (Rochester); Secretary, Mrs. W. B. Frye (Buffalo) and Recorder, Miss Ethel B. Champion (New York). There were five original member clubs: Buffalo Cat Club, Connecticut Cat Club, Washington Cat Club, Lockehaven Cat Club and the Atlantic Cat Club. Of these, all but one, Buffalo, had resigned from ACA. Mrs. Locke, the President of ACA, was greatly upset and indignantly wrote a letter to Mr. C. H. Jones, Editor and Publisher of “The Cat Journal”, which was printed in the March issue. It is my wish to let the Cat Fancy know through The Cat Journal that I have resigned my membership in the Atlantic, Lockehaven, and Washington clubs, as I cannot consistently work with clubs who would strike at the very foundations of influence and success by dividing our strength and weakening our colors. I consider the movement as harmful and ill advised. One strong Association for the government of our shows and club conduct is all we need and can digest. The American Cat Association needs and should have the loyalty and cooperation of all the clubs. Feeling greatly surprised and disappointed, I remain. 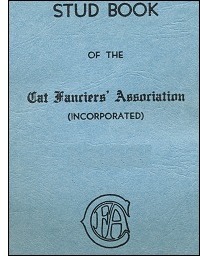 Two more clubs joined CFA in September, 1906 – the Bay State and Danbury Agricultural Societies – and in November, two more – the Royal Canadian Cat Club and the Short Haired Cat Society were added. The first show held under CFA rules mentioned in “The Cat Journal” was put on by the Buffalo Cat Club on December 4-5-6, 1906, with 168 cats. The judges were Mr. Joshua Cowpland, Jr., and Mr. A. E. Field-Marshall. Mr. Field-Marshall judged a second CFA show a week later in Toronto. There were 183 cats present, and it was a two point show. In addition to the above mentioned judges, Mrs. H. G. Dykhouse, Mr. A. Burland, Dr. H. O. Walters, Miss E. B. Champion, Miss Dorothy Champion, Mr. H. F. Vidal and Mr. T. Farrar Rackham are all mentioned several times in the early show reports. The first Long Hair Specialty Club was organized in Buffalo, December 5, 1906 – the Blue Cat Society of America, and functioned most successfully for many years. The Society and individual members have done much fine work in furthering the interest in the Blue Persian. Actually, the first Specialty Club in the United States was the Short Haired Cat Society, but intensive research has not revealed the exact date of its founding. 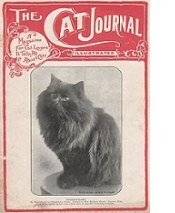 At the end of 1906, CFA started publishing a Stud Book and Register in the “Cat Journal”. There were to be 25 entries each month. In 1909, Volume I of the CFA Stud Book and Register was published in book form. The December 1909 “Cat Review” commented: “In establishing this studbook and register, with departmental recognition, the CFA has rendered the greatest service to the fancy that has ever been accomplished by any association”. Number 1 in the Stud Book is a Long Hair Kitten named Peter. However, since the Kitten Register was not included in the Stud Book proper, the first cat actually listed is a Long Hair Tortoiseshell Female, Molly Bond, number 5. 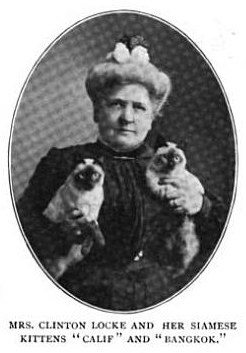 Molly Bond is undoubtedly Peter’s dam, since both were registered at the same time, along with three other kittens, by the owner, Mrs. Ricker. 19 Champions were listed, but there is no way of ascertaining which was the first as they are listed alphabetically. There were 11 Cattery names, the first being KENILWORTH, which belonged to Mrs. Frye. Volume II was authorized in 1910 at the Annual Meeting, but was not printed until 1912. In this volume, 19 Champions and 17 Cattery Names were listed. Volume III was published in 1913 with 8 new Champions and 12 Cattery Names. Volume IV made its appearance in 1915 in which 9 Champions and 6 Cattery Names were listed. Volume V came in 1917, with 33 Champions and 29 Cattery Names. It is interesting to note the strides CFA has made through the intervening years. Hundreds of Champions are now listed in each Volume, and there is a total of 3054 Cattery Names through Volume 86. It was in Volume V that the Barbe Bleue Cattery Name, registered to Mrs. Eva T. Harris of Los Angeles, first appeared. Many famous Long Hairs have had Barbe Bleue as a part of their name. In 1907, CFA held its first Annual Meeting in Madison Square Garden in conjunction with the Atlantic Cat Club show January 3, 4, and 5. Delegates were present at the meeting from the Lockehaven, Buffalo, Washington, Connecticut, Atlantic, and Short Hair Clubs. The Treasurer reported a cash balance of $41.50. “This was considered a very satisfactory showing for the young organization.” The fundamental principal of the C.F.A. is “home rule!”. The registration fee for kittens was 25 cents. A winner of a CFA championship was eligible for registration, regardless of ancestry - “It was provided that the judgement of the judges must be final”. The next Long Hair club to be organized was The Silver Society. It began in Toronto, September 3, 1909, and belonged to both CFA and ACA. Their first Show was held in New York, December 16, 1912, and was the first Specialty ever held by the Fancy, either in the United States or England. There were two separate shows with separate entries, prizes, etc. The CFA judge was Mrs. Elbert Bess, Secretary of CFA; the ACA judge Miss J. R. Kroeh, Secretary of ACA. The president of The Silver Society, Mrs. Mitchelson, was also president of CFA. This double show was repeated December 10-11, 1913. It is interesting to note that the Standard for Chinchillas, Shaded Silvers and Smokes adopted by The Silver Society on January 9, 1913, is practically the same as we have today. During these years, many new clubs were accepted by CFA, and some resigned. The Lockehaven Cat Club left CFA in April 1908, and the Rochester Cat Club was organized June 15th of that same year to take its place. The Empire Cat Club has remained faithful through the years and is the oldest Club now in CFA. It was organized December 5, 1913, and was admitted to membership in CFA at the Annual Meeting December 30th. The next oldest is the Westchester Cat Club. This club joined CFA at the September 3rd, 1915 meeting of the Executive Board.